Custom Embossed 1984-1990 C4 Corvette Floor Mats on Sale at SCP! You already drive one of the best looking cars around, but after 20+ years your original floor mats are probably looking a little bit tired. We've got very nice logo embossed 1984-1990 C4 Corvette floor mats. We offer these C4 Corvette floor mats in a variety of color options, from black to bronze to saddle and everything in between. These C4 Corvette floor mats are sold as a set, one left and one right. Are these pretty good about not wadding up? I just purchased a 94 last week with a pretty decent looking set of mats in it, but every time I use the clutch, my shoe wads up the driver's side mat. They look good, but I'm thinking they are kind of thin, and that may be causing this. I don't mind spending good money on a set of mats as long as they perform. Yes, we've sold a lot of them and never heard or saw an issue with them wadding up. We can buy mats all day long like this for the same price of $89.00 from any of the aftermarket Corvette supply houses. I think if you offered them at a price somewhat lower (maybe $69.00?) or at least $15.00 lower than your competitors, you would get quite a few sales! I know I'd be interested. Last edited by FOURSPEEDVETTE; 10-23-2015 at 10:17 AM. I'm sorry, if we could discount them further and still make money we'd be glad to. 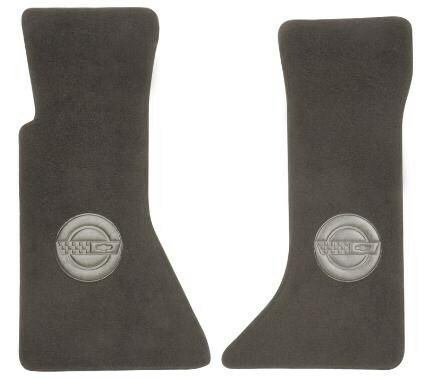 Quick Reply: Custom Embossed 1984-1990 C4 Corvette Floor Mats on Sale at SCP!